work environments, thanks to our unique design and patented technology. Our impactable roll-up door solutions are perfect for fast paced and rugged work environments, thanks to our unique design and patented technology. Easy door repair and reset after an impact means reduced down-time and increased productivity. efficiency thanks to its insulated curtain and quick opening/closing speeds. Our high speed freezer doors will decrease energy costs and increase efficiency thanks to its insulated curtain and quick opening/closing speeds. meet your industry’s specific needs. 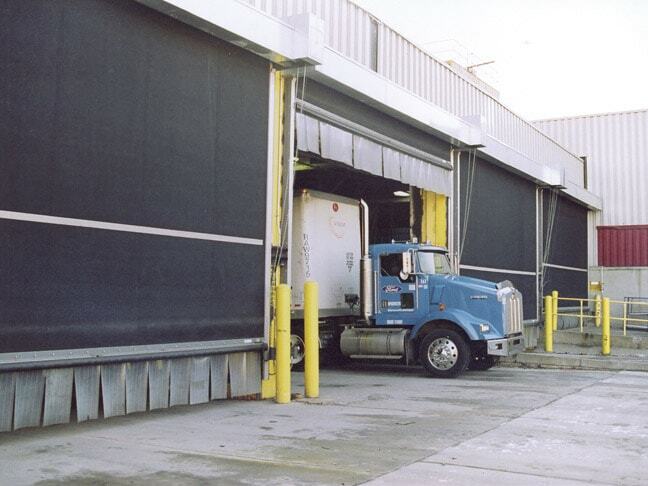 TNR has a variety of high performance roll-up doors to meet your industry’s specific needs. that will put your maintenance concerns to rest. Your fast paced and rugged workplace demands tough doors that will put your maintenance concerns to rest. Find a TNR representative for your region. Explore TNR’s broad product line of High Performance Doors. Search for the TNR door you need depending on the industry. See how TNR doors were used to fix different issues. TNR Doors provides a new generation of custom high performance doors that provide best-in-class durability and reliability. Durable & flexible rubber doors that can really take a hit. High speed, tight seals and insulation for environmental control. Doors suitable for both interior or exterior applications. Distribution and Transport facilities benefit from fast, tough doors. We take pride in introducing you to TNR Doors. Emerging as a leading name in the marketplace, our dedicated team has over 435 years of combined experience in the commercial and industrial high performance door industry. With over 50 years of combined experience specifically in engineering and applications problem solving, a new and evolving generation of high performance roll-up doors has been brought to market, meeting the specific needs of businesses worldwide. We want to earn valued word-of-mouth business because our doors help keep our customers’ costs in line and their businesses moving. We value the commitment that our employees, customers and suppliers have placed in us. We approach each other with honesty, care and mutual respect. We have over 50 of years experience specifically in engineering and applications problem solving. Challenge: Keep the sand storms out and keep door maintenance to a minimum. 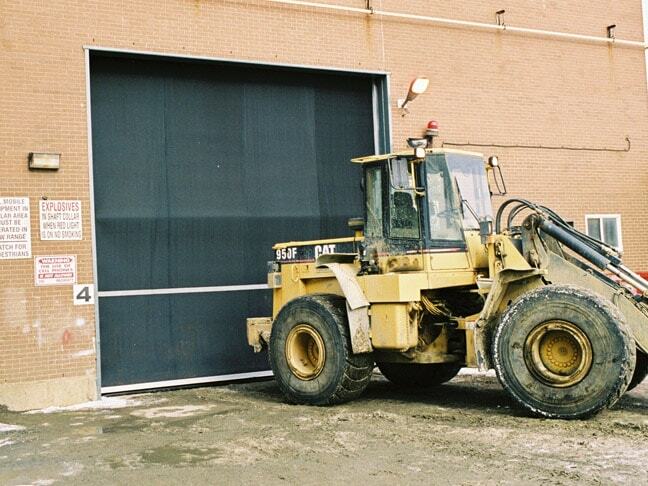 TNR’s rubber roll up doors were chosen due to their tight door fit with minimal infiltration and the simple, yet effective operation in rugged conditions. The HDXL and HDC-DD have SBR rubber curtains with polyester core weave making the doors flexible but still resistant to abusive environments, even in the extreme temperatures of the Sahara Desert. Challenge: Install before harsh winter set in. TNR Industrial Doors was chosen due to their simple door design, ability to take an impact without door damage and TNR’s strong reputation, which is well known throughout the mining industry. TNR was able to meet Baffinland’s tight lead times for manufacturing the doors. Also, TNR was able to coordinate ocean freight to ship the doors directly to the mine site in order to have the doors installed by the winter deadline. Challenge: Large temperature differentials, constant ice build-up, doors jamming, high traffic flow. TNR Industrial Doors can solve these difficult issues with their model HDT door. 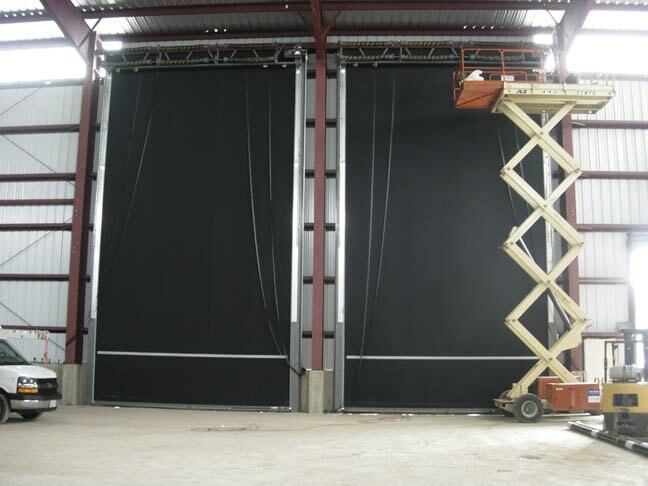 The door has a heavy duty low temperature 0.25” thick EPDM rubber curtain that is rated for continuous use at -40° to -50° F. The EPDM curtain remains flexible and straightens quickly to enter the guides during the closing cycle. Ice does not build up the same way it does on conventional products. Broadwind already had a very positive recent history with TNR doors in a blast booth application. The doors had proven to have a tight seal, were low maintenance and had the ability to withstand accidental impact. The heavy duty doors would accommodate the large equipment used to move tower sections in and out of the building. Broadwind’s concern about windload was quickly put to rest with TNR’s 90 mph rating. TNR’s heavy duty door construction and springless design were key features for the operations team. Management’s initial apprehension for the cost of these large doors was allayed when safety risk and ROI was fully reviewed. Such an extremely tall door is only available as a rubber roll-up door, a fabric door or a blade door. A large fabric door is just not durable enough in this rugged mining environment. A blade door, although very durable, requires a larger footprint and more maintenance. A TNR rubber roll-up door is a simple yet extremely durable design that can be built tall enough to accommodate these service doorways. Since 2006, Oyu Tolgoi has installed over 25 TNR rubber doors on many of its mine’s operations buildings where the doors have proven their reliability and long service life in a rugged environment. Stay up to date with all the latest company and industry news.